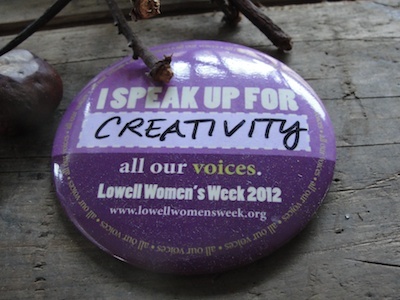 This button from Lowell Women's Week sits on the surface under my computer reminding me that creativity is what it's all about for me and of the need for gentleness in my teaching. At the LWW breakfast, buttons and markers were at all the tables. Despite all I do to put myself and my work out into the world, I felt a slight panic at having to think on the spot and decide what exactly I speak up for. After some mind wandering, I thought of writing "art" and then amended that to "creativity" to include all the ways we can nurture creativity in our lives, art being just one avenue. My twinge of nervousness was a reminder of the importance of creating a warm and encouraging atmosphere in workshops to make the process feel organic and inevitable so that all can be creative with comfort and ease. And in this attitude of acceptance, I decided not to retake the photo when I noticed all the dust on the button. I'll be doing a final summary post on the the All Our Voices Lowell Women's Week 20112 Public Art Project for the next Book Arts Tuesday. What a great thought! Nice to know my house is covered with stardust. I love watching the light streaming through the stardust and enjoy watching cobwebs grow too but then (usually when I am procrastinating about a drawing that's going a bit awry) I go on a dust bunny expedition capturing some truly huge ones where they lurk in the forgotten corners and the really big ones are often under the bed & set them free in the garden, they add texture to the mulch!